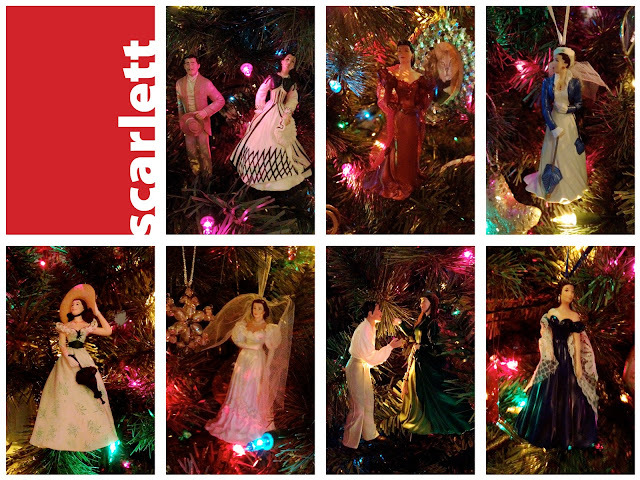 Another collection on my tree that I love are my Scarlett O'Hara's. Yes, I suppose this is subject that is somewhat unrelated to Christmas. But, these also make me think of my family, and our shared love of the book and the movie. And, I am a bit of a girly girl. I think I would have made a fantastic southern belle. While I decked the halls inside, Greg headed out side on a beautiful warm Saturday to string up our exterior lights. We had a few more available this year since we didn't need for our tree inside anymore. We thought the color on the door and railing was a reasonable way to make a transition between the white lights on the bushes. I'm pretty picky about random strings of lights acting as extension cords between objects. I think Greg did an awesome job making it all fit perfectly. When he was done, he wasn't quite satisfied. Even though he has virtually no extra time these days, he headed off to buy some icicles to add along the long of our garage and above the living room window. He hung the first set on Monday night. It was a fun surprise to me when I pulled in the driveway! I still have to get a photo of the finished product. I bought this purple frame awhile ago thinking it was perfect for this room. But, I haven't yet found the time time fill it with an actual photo. So, as a place holder, I cut a piece of this wrapping paper I found, which is so perfect for our house, I can hardly stand it! I also used the wrapping paper in the glass door to our cabinet. I've been experimenting with a way to make the glass translucent so we can have some hidden storage, but I haven't found something that I'm happy with yet. This is a great place holder which picks up the green from the coffee table and the teal from the walls. Last year, I bought the green picture frame below, and a can of green spray paint which I used on the mitten frame above, and the tree on the shelf below. I thought, why not try to repurpose some of our more traditionally colored accessories to match my color scheme. I happen to love when a Christmas color scheme complements the colors that are already happening in a room. I went a little snowflake crazy in here. All 6 pointed of course! Every year, I love to fill a vase with bulbs. 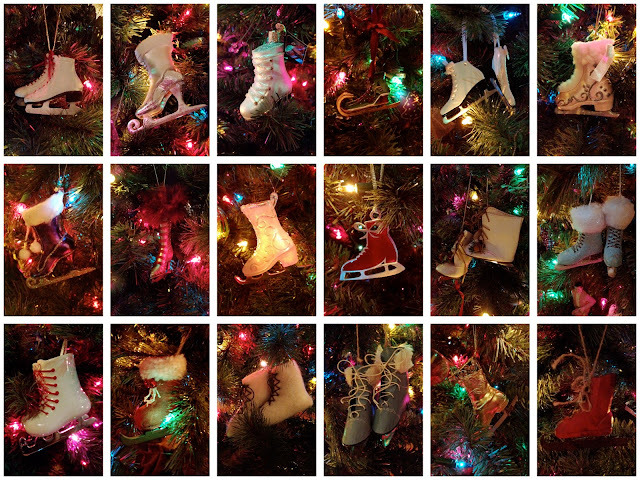 This year, I added some other items like the crystals and ribbons to bring in my green accent. Just a little behind the scenes, here's how it all looked when it came out of the attic. I wonder how long it will take us to get it back into this state come January?? As promised, I wanted to show you our giant leaf pile, along with the results of some of the other yard clean up we did a dew weeks ago. I'm not sure if I mentioned, but our town offers a great service where they will vacuum up all the leaves as long as we rake them all to the curb. Everyone gets a week based on their trash pickup. Our week was the week of Thanksgiving, which was perfectly timed to allow all the leaves to finish dropping before we had to rake. What we didn't anticipate was that there would be utility work going on in the street on the day we planned for our raking. The jack hammer sound track left a little bit to be desired. Greg got the crew to move their tar from our curb though, so we could have a place to pile the leaves. Around the side of the house, in the patio area, we had to deal with the remnants from the storm. We made two piles of debris, one of wood we we'll be able to burn once it's dries out, and the other of the twigs and leaves to be picked up as yard waste. After a few hours, it looked like this. And, by the time we left for Thanksgiving dinner, the leaves and twigs in the front of the house were all gone!